What started off in 2005 as a small collection of English-capable restaurants and shops listed on EnglishOK.jp has now evolved into EOK.jp - Japan's Premier Shop Directory. If you were an active user of EnglishOK.jp you might be asking why did we go and change a good thing? Well, to keep it totally simple, we listened. We listened to our website viewers, friends, and colleagues at English OK and we heard them repeat a common wish. "I wish I could find non-smoking restaurants"
"I wish I could find an English-speaking dentist"
"I wish I could find baby-friendly cafes"
"I wish I could find ............."
We hope you enjoy and make good use of our shop directory. If you have any suggestions on how we can improve the site or just want to let us know what you think of EOK.jp please contact us at any time. About English OK Co., Ltd.
English OK! was founded in 2004 to support and promote service businesses in Japan to the international community. Since its inception, English OK! has led the way in the service-English training industry by providing custom training programs to thousands of service staff in multiple industries ranging from 5-star hotels in Tokyo and ryokans in Kyushu to city bus operators in Himeji. Now with over 20 industries covered and national training services offered English OK! has grown to become the leader in service and hospitality English training throughout Japan. In addition English OK! 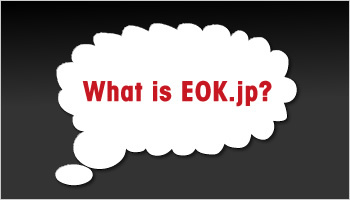 offers custom e-Learning solutions, multilingual web/print design, translation services and Japan's Premier Shop Directory - EOK.jp. For more detailed information on any of our services please contact us at 03-3712-7232.